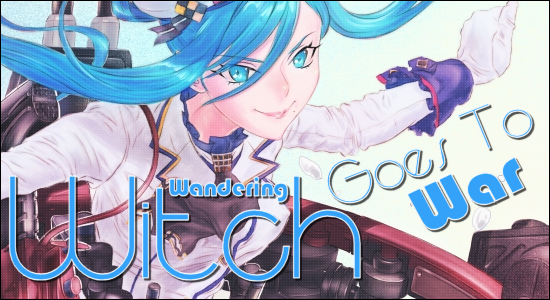 91.8 The Fan » Blog Archive » The Wandering Witch – Goes to War! Welcome, all, again. 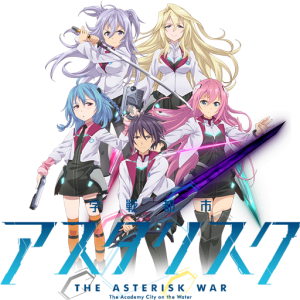 We will this time be discussing The Asterisk War, another in a long line of tales involving high school students battling each other with magic. Why, that’s two columns in a row! you might think, and you’d be correct. But I have my reasons. You see, whereas last month’s subject series, Anti-Magic Academy: The 35th Test Platoon, hit the ground running with strong storylines and interesting characters, The Asterisk War had to grow into a show with its own story and sense of self. 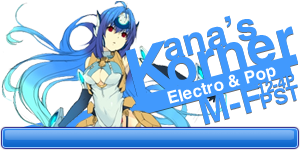 All of the unfounded fears I had concerning Kancolle–following as it did upon Arpeggio of Blue Steel, a strong show with at least vaguely similar premise and characterizations–came home to roost with The Asterisk War: weak initial storylines; unoriginal characters; being buried beneath the weight of its [genre’s] tropes. It seemed to favor imitation over originality or effort. But then something amazing happened, and I watched spellbound as this ugly duckling transformed into a swan. Now, how did that happen? 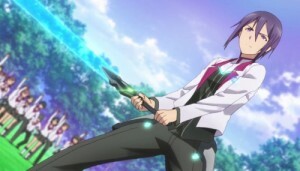 The Asterisk War follows Ayato Amagiri as he transfers into Seidokan Academy in search of his missing older sister. But this school is far from ordinary, being one of six academies within the city of Rikka dedicated to preparing their students for fearsome gladiatorial-style combats called Festas. It happens that Ayato lives in a post-apocalyptic future in which the earth was struck by a giant meteorite, which collision killed countless people and destroyed many cities and large tracts of urbanized areas. That same collision also released into Earth’s atmosphere extraterrestrial contaminants which then mutated a small portion of the surviving humanity, granting them enhanced abilities. These people are collectively called Genestella and are subject to great prejudice by most others. After all, this is a world still mourning those lost to tragedy, so what else but contempt for those who benefited from it, however inadvertently? But as bad as that sounds, an even more sinister aspect underlies the Festas. Not only people and cities died because of the meteorite–governments did, too. Government at all levels worldwide was overwhelmed by the magnitude of destruction and could not effectively respond, thus creating a power vacuum as desperate people sought sustenance. The organization which arose to address these needs was the Integrated Enterprise Foundation, a virtually autonomous global corporate venture dedicated to profit and possessed of quasi-governmental powers, reminiscent of the old East India Company. [Founded by English Royal Charter, the East India Company operated as a de facto government in India and other Asian territories (particularly China), passing laws, enslaving local populaces, and maintaining their own armed forces to ensure native submission and protect trade monopolies.] Furthermore, IEF leadership also seems especially fond of another lesson from history, the Roman axiom: “Give them bread and circuses.” To wit, the secret to maintaining power is to ensure that the masses are fed and entertained. And if that entertainment just happens to snuff out certain individuals of enhanced ability who might otherwise help better mankind’s state and thus free them from corporate dependency, then bonus! Enter Ayato. 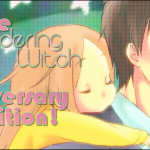 The trail left by his vanished sister leads him to Seidokan Academy, where he quickly finds other girls who are ready to coax him from his past and tie him to their present. 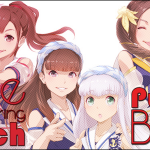 And so he begins assembling his accidental harem: Julis, an impecunious princess; Claudia, the student council president and daughter of an IEF board member; Saya, the obligatory underdeveloped childhood friend; and Kirin, the likewise obligatory overdeveloped young innocent. But as the series progresses, these ladies begin to outstrip their archetypes and find their own voices, greatly contributing to the development of not just individual storylines but also the overall plot. Their personal growth acts as a counterpoint to Ayato’s stasis–he remains very much the person that he was when he arrived, but it is this continuity of his character that helps his friends grow as they do. He is the constant to which they know they can return. But even that staid role signals danger to the IEF; such quiet strength marks Ayato as a leader, one not under IEF control. I was not impressed with The Asterisk War when I first saw it–thank goodness I kept watching! It initially seemed to have too many borrowed elements while lacking any coherent vision through which to unify them; I dared not hope for originality or sense of self. But I began to take the show more seriously with the emergence of its themes of prejudice and oppression. We are reminded that evil exists, but that to combat it we must first recognize and name it. Add some teenage emotional hypersensitivity and some great fight sequences, and you’ve got yourself a show! 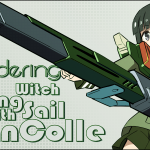 Watch episodes 1-12 on Crunchyroll; new episodes are scheduled to air in April. I appreciate the feedback. The Asterisk War has turned out to be much more enjoyable than it first let on–it was one of those shows that had to hit its stride. 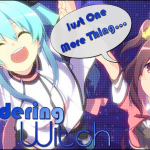 I’m eager to see it return with its second 12 episodes!